Rare, impossible to cultivate and renowned for its unique taste and aroma, White Truffles are the ultimate luxury food. With a short season from October to the end of December, this jewel of Italian gastronomy is one of the world’s most highly prized ingredients. 2013 is reported to be the best white truffle harvest for more than a decade, with an abundance of high quality truffles which are exceptionally fragrant and delicious. To celebrate the quality of this year’s harvest and allow Marbella residents to sample the delights of this stunning product, local restaurant Il Tartufo (The Truffle) have created a special tasting menu where the white truffle is the star. Throughout November the five course menu of simple, yet delicious Italian cuisine including homemade tagliolini pasta, saffron risotto and sirloin steak will be accompanied by the finest white truffle flown from Italy to order. This is a real celebration of the truffle and a luxurious event, but there will also be daily specials featuring white truffle as starters and main courses, so guests can sample the delicacy for the first time before taking the plunge. Reservations for the White Truffle Tasting Menu must be made at least four days ahead, to allow time to fly the truffles direct from Italy and a deposit is required to secure the booking. Il Tartufo’s Chef and Owner Emanuele Crisci is originally from the Piedmont region famous for their truffles and fondly remembers his friends taking to the hills with their dogs searching for these prized ingredients. His love for the food of Italy led him to train as a chef and strive for excellence, working with Italian superstar chef Antonio Carluccio as Head Chef in one of his London restaurants. 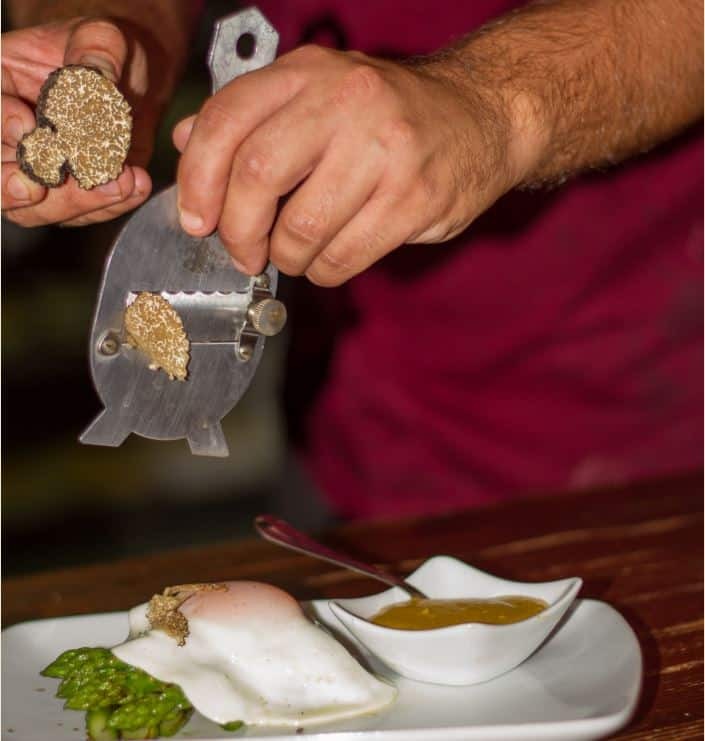 His heritage and training combined to create a real passion for truffles, so when he opened his restaurant in Marbella in 2011 there was only one name for it – Il Tartufo.